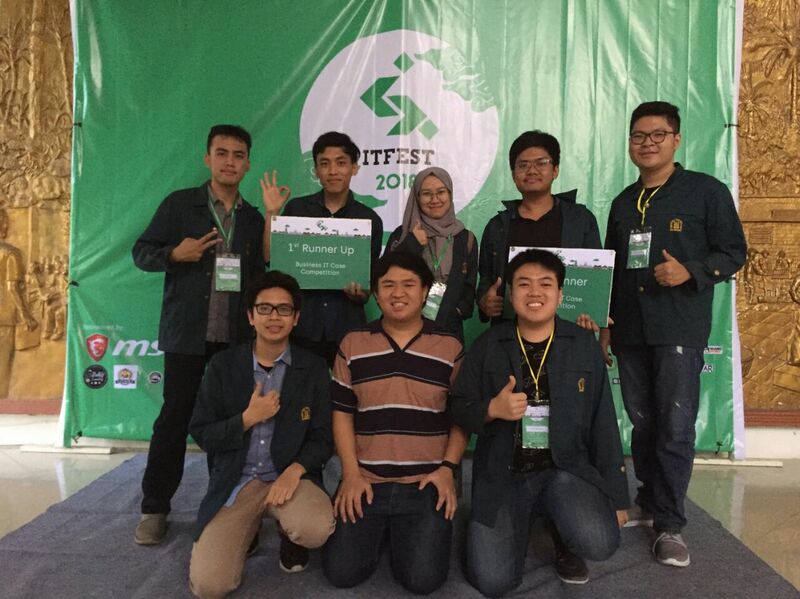 2 teams from Information Technology System Study Program won ITFEST USU Business IT Case Competition. RNA team, whose members are Rizaldy Al Kautsar Utomo, Atika Rahmawati Yuliantoputri, and Nindy Aditya Dewi won first prize; while the Jatangsol team, which consisted of Alessandro Aria Wibowo, Ronaldo Matthew, Al Varrel Putra Kusuma won second place. Another team, namely Team Baru Bangun, made it to the final but did not bring home the title. ITFEST 2018 is a competition in the field of Information Technology and Communication level of students in Indonesia organized by Information Technology Student Association (HIMATIF) University of North Sumatra, as an effort to raise the spirit of the students of Indonesia to innovate to create solutions of problems experienced by this nation and able to take part as a change agent in advancing Information and Communication Technology and its utilization in Indonesia. ITFEST 2018 has the theme “Innovation to Empower Indonesia Youth”. ITFEST 2018 series consists of student-level competition in Indonesia, exhibition of competition finalists, seminars on current topics in the field of ICT, and entertainment. ITFest’s Business-IT Case itself is a nationwide case-solving competition organized by the Information Technology Study Program of the University of North Sumatra. ITFest Business-IT Case 2018 is aimed at undergraduate and equivalent students and D3 / equivalent.Business-IT Case provides an opportunity for Indonesian students to solve various business cases by providing solutions through the Information Technology approach. Participants are expected to have excellent problem solving skills in which the ability will be tested in Business-IT Case competition. Previously, the participants first followed two preliminary rounds done over long distances. Participants worked on the problem within a certain time limit, also answering the matter of analysis in the form of Executive Summary which is a summary of business ideas as a solution of case studies written in detail. The team that goes into the next allowance should create a business plan of the product being created. In the end, the team that qualified for the final round had to present their idea at the top event, which was held in USU North Sumatra, on 10-11 March.